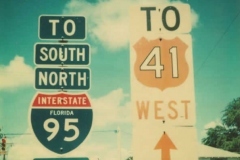 18 U.S. highways serve the state of Florida. 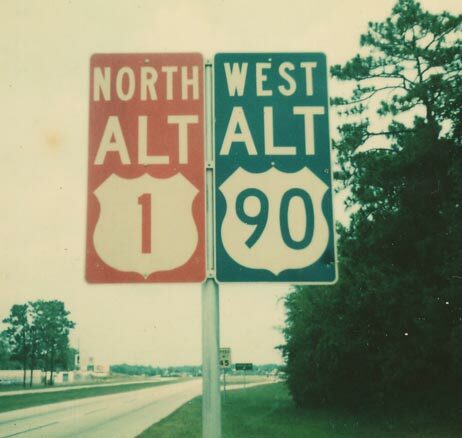 Between 1956 and 1993, a specific color was assigned to each route to aid in motorist navigation. 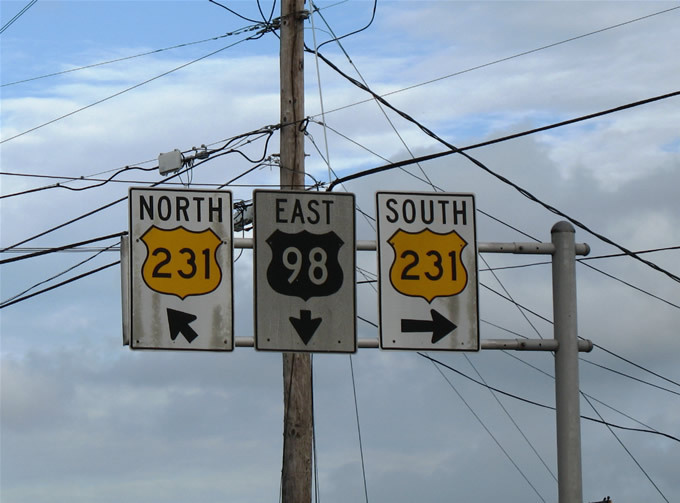 When two or more routes overlapped, each would retain their respective color on shield assemblies. 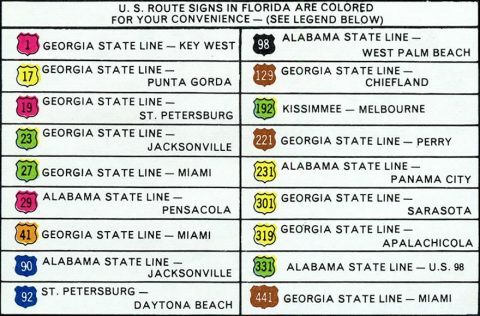 The system assigned a unique color for each route, under the premise that a U.S. highway would not intersect another route using the same color scheme. An exception to this rule took place in 1971. 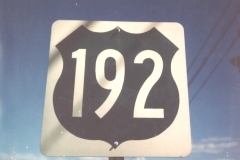 With both routes signed with green markers, U.S. 192 was extended west from Kissimmee to U.S. 27 at Four Corners. 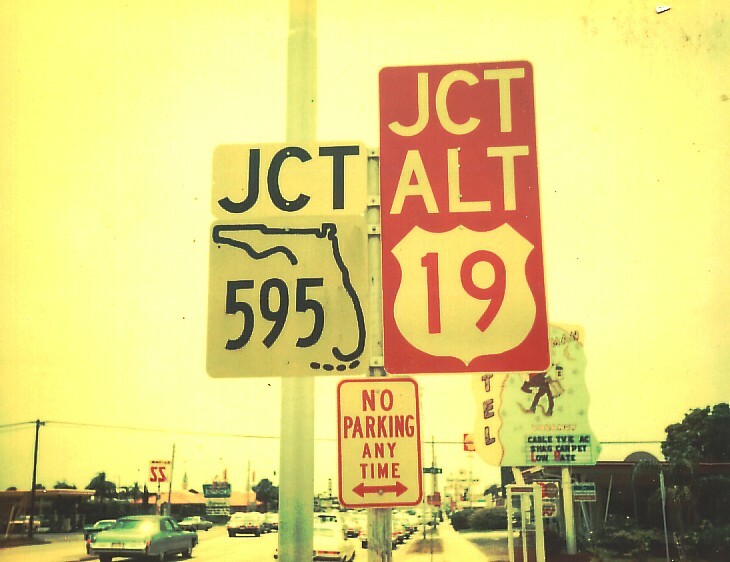 Florida discontinued the colored U.S. route system in 1993 to comply with federal signing standards outlined in the Manual on Uniform Traffic Control Devices (MUTCD). 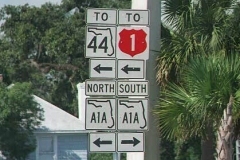 Going forward, all routes were signed with nationally standard black and white markers. 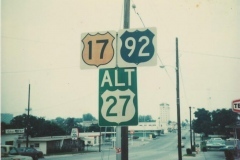 However as existing stock was used, some new colored route markers were installed until 1996. 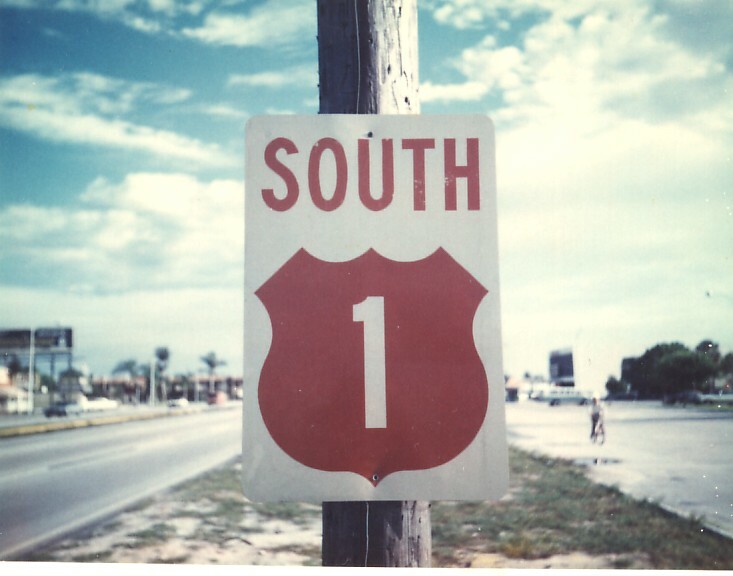 Over the ensuing decades, colored U.S. route markers in Florida were replaced, leaving very few remaining assemblies across the state. 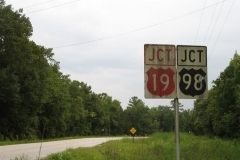 Those still standing are generally found in rural areas of the Florida Panhandle, the Big Bend area, and North Florida on county roads or former state secondary roads. 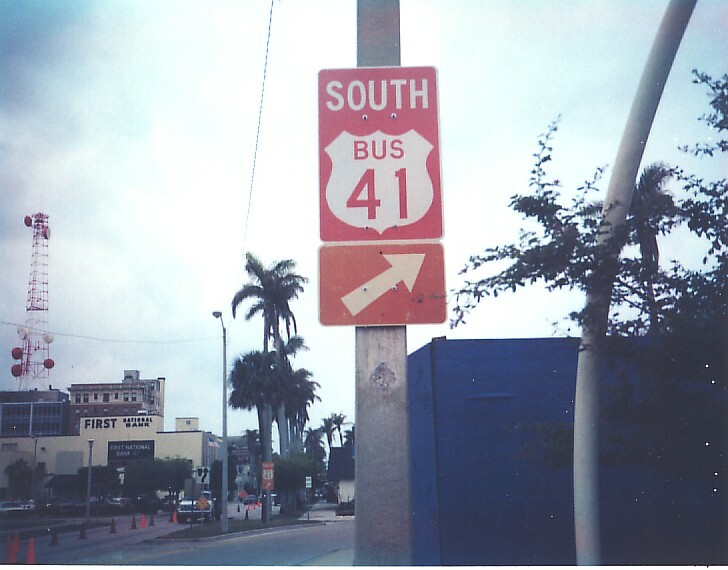 U.S. 1 south of Sample Road (then Fla S-834) in Pompano Beach. 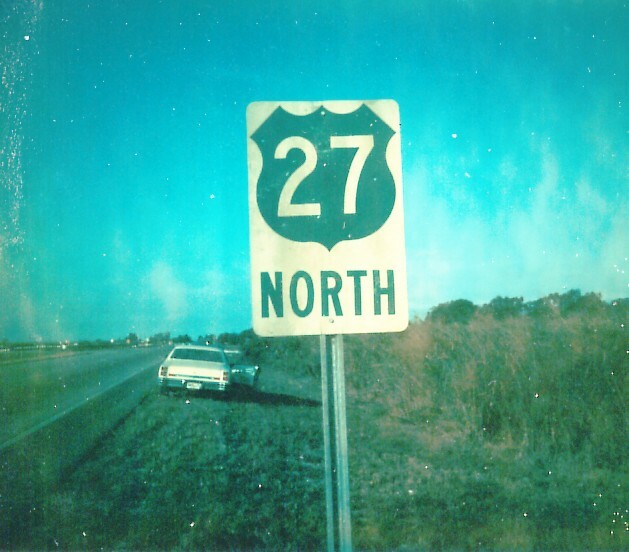 Photo taken by Michael Summa (1974). 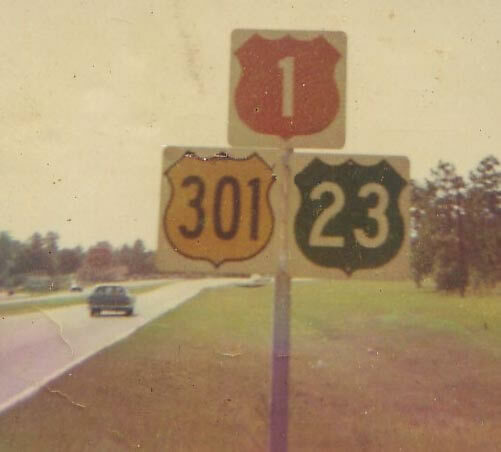 U.S. 1-301-23 overlap near Callahan in Nassau County. 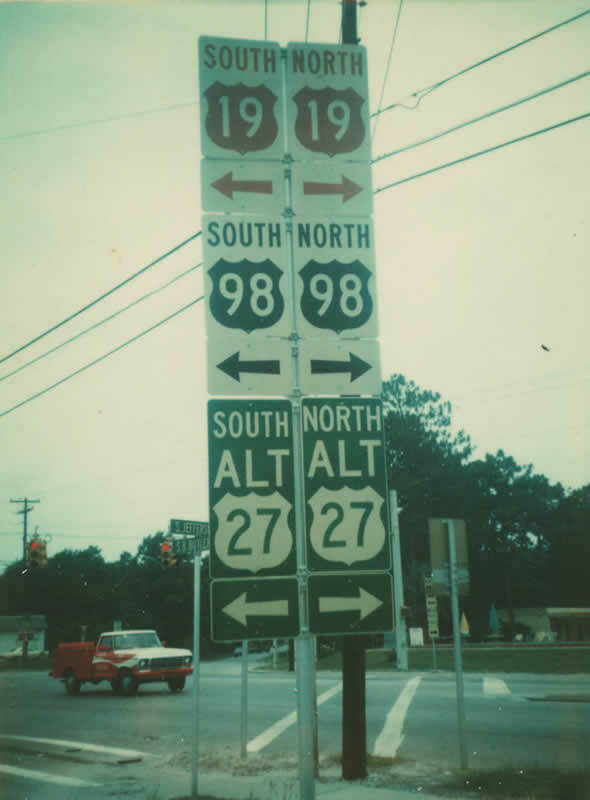 Photo taken by Michael Summa (1968). 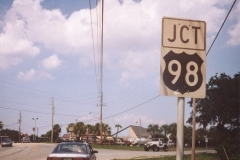 U.S. 90 east splits with U.S. 1 south in Jacksonville. Photo taken by Jeff Royston (07/00). 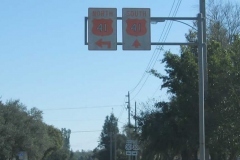 U.S. 1 trailblazer in New Smyrna Beach. Photo taken by Jeff Royston (07/00). 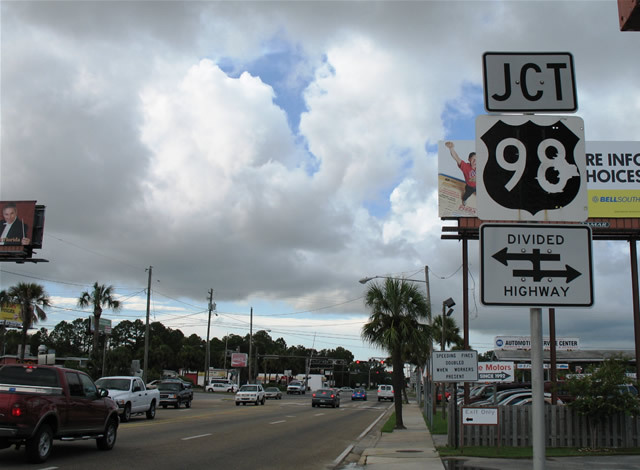 U.S. 1 Alternate and U.S. 90 Alternate overlapped in Jacksonville. 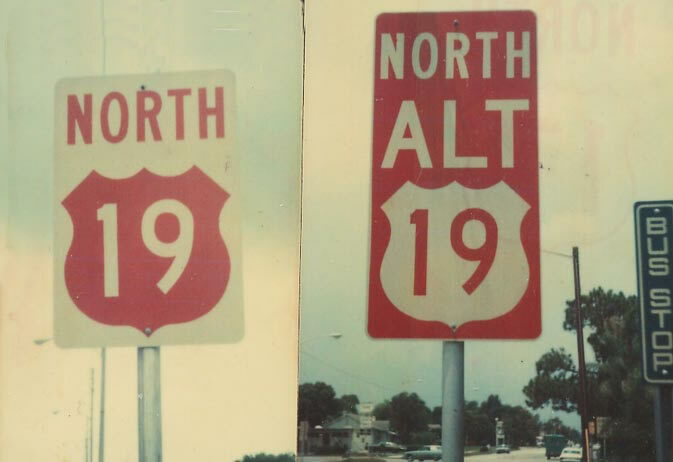 Photo taken by Michael Summa (1978). 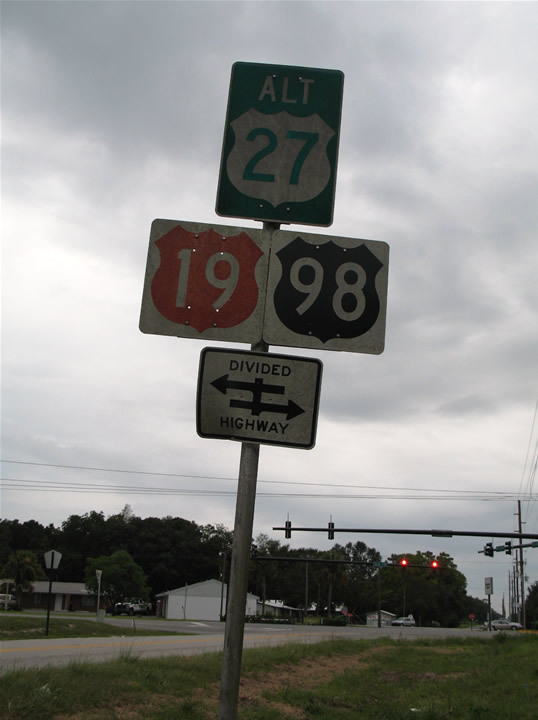 U.S. 27 Alternate ran along what is now Florida 17, including a short overlap with U.S. 17-92 through Haines City, until 1998. 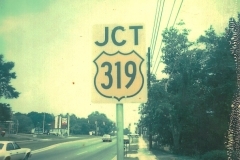 Photo taken by Michael Summa (1983). 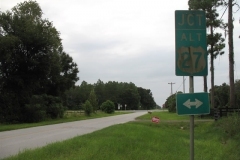 U.S. 17-92 follow a combined routing along SR 500 and SR 15 between Lake Alfred in Polk County and DeLand in Volusia County. This assembly was still standing in Davenport as of 2017. Photo taken by Justin Cozart (12/03). 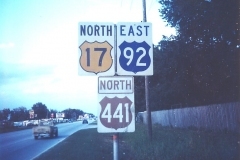 U.S. 17-92-441 shields near Kissimmee. 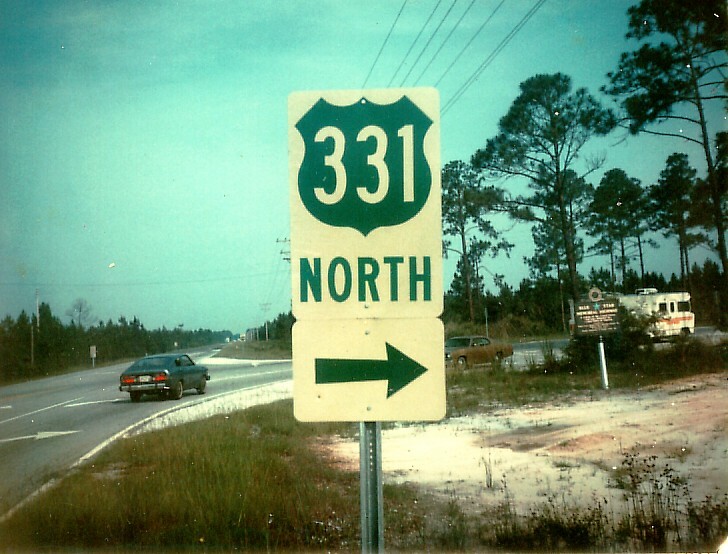 Photo taken by Michael Summa (1983). 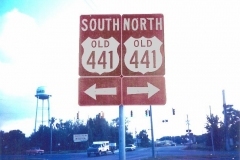 U.S. 441 travels the state from Miami north to Lake City via Broward County, Palm Beach County, Orlando and Ocala. 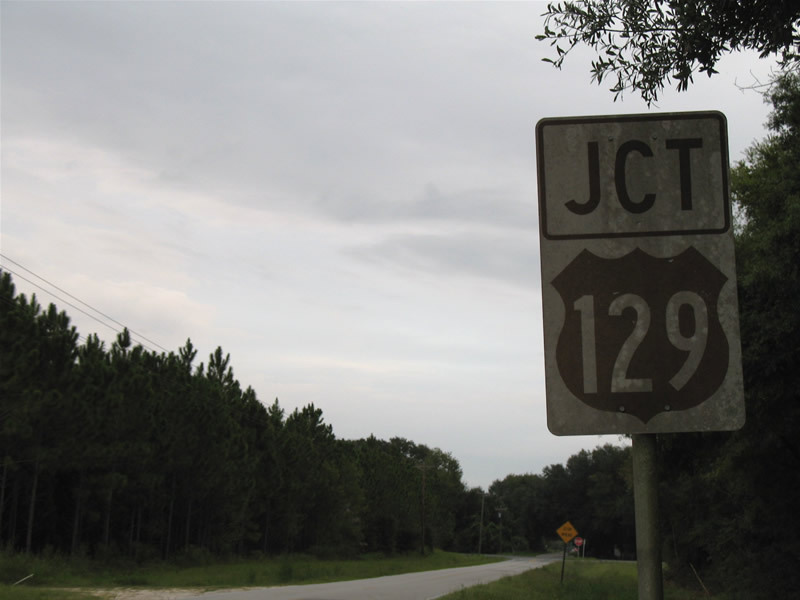 Here it is routed with U.S. 17-92 along Orange Blossom Trail. 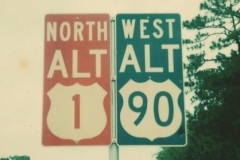 Photo taken by Jeff Royston (07/97). 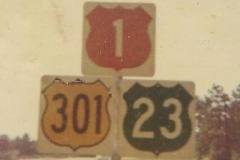 Like U.S. 1, U.S. 19 shields were also red. These assemblies were posted in St. Petersburg. 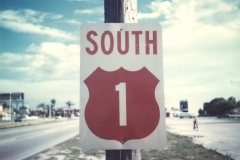 Photo taken by Michael Summa (1976). 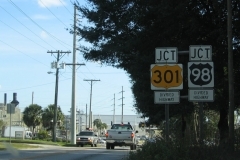 Levy County 320 west at U.S. 19-98-27 Alternate in Chiefland. Photo taken 08/12/06. 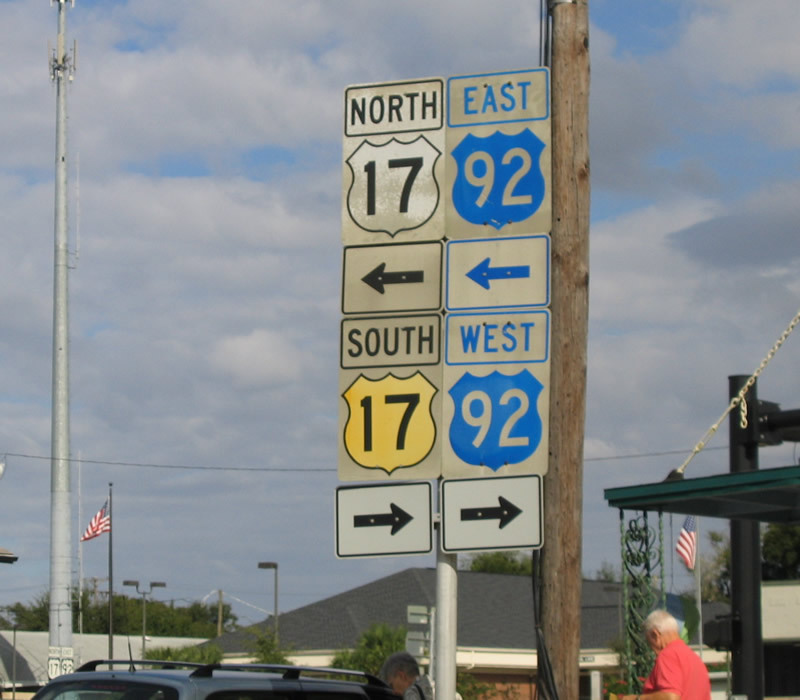 The south end of U.S. 221 at U.S. 19-27A-98 in Chiefland. 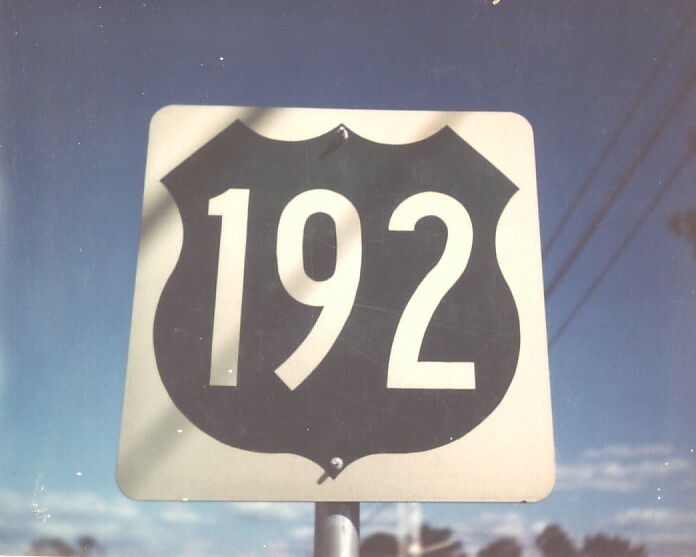 Photo taken by Michael Summa (1978). 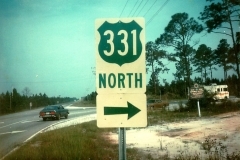 Levy County 326 westbound approaching U.S. 19 & 98 at Gulf Hammock. Photo taken 08/12/06. 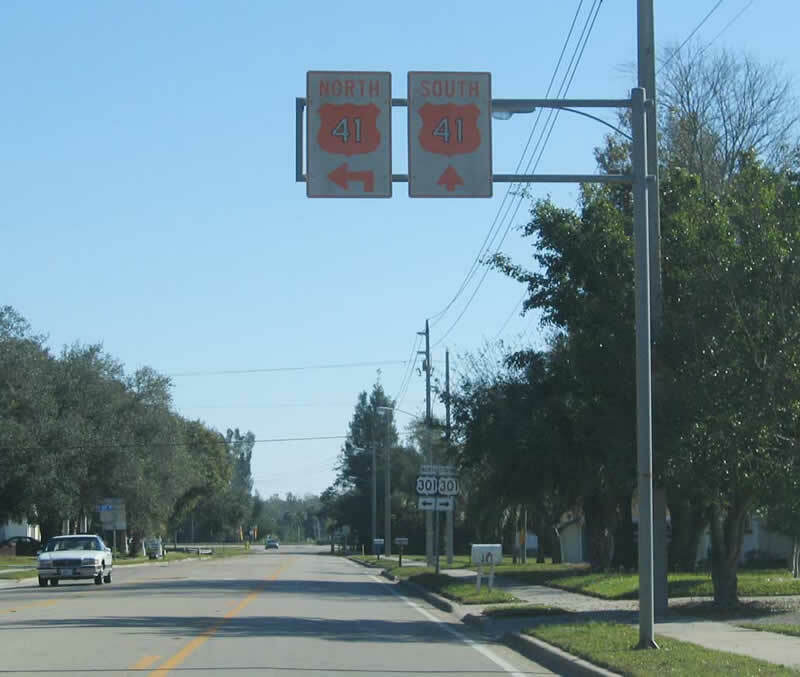 U.S. 19 Alternate and Florida 595 shield assembly posted ahead of 5th Avenue North in St. Petersburg. 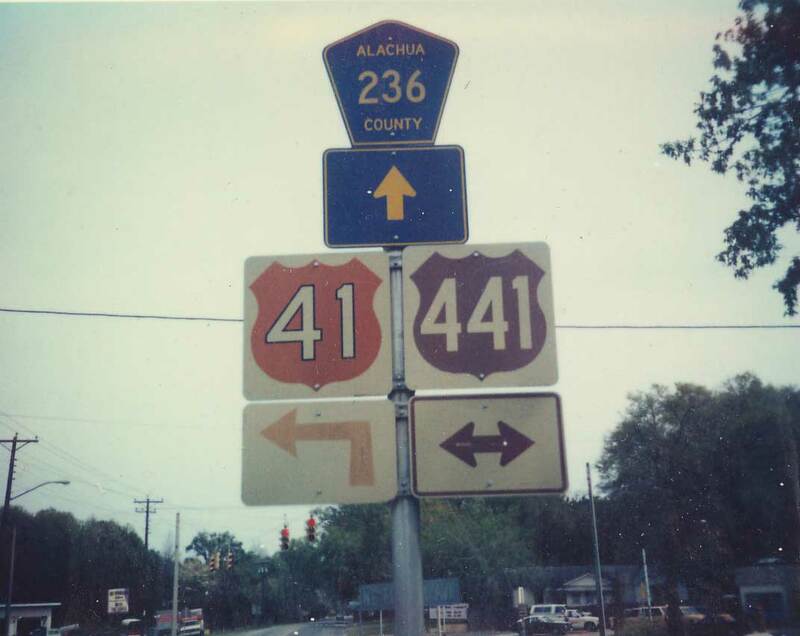 Photo taken by Michael Summa (1975). 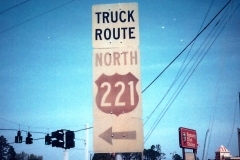 An older style U.S. 27 confirming marker with the cardinal direction below near Clewiston. Photo taken by Michael Summa (1982). 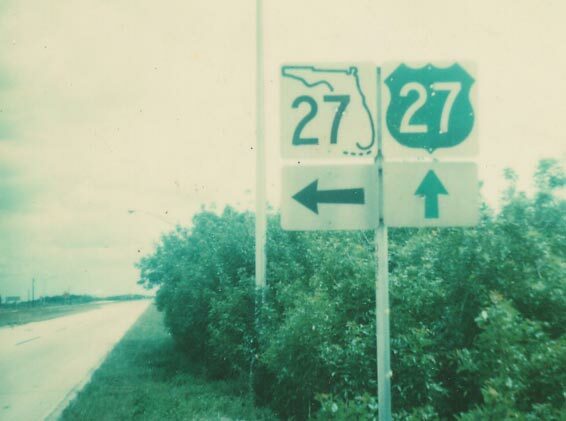 Prior to 1987, U.S. 27 and SR 27 intersected northwest of Hialeah. 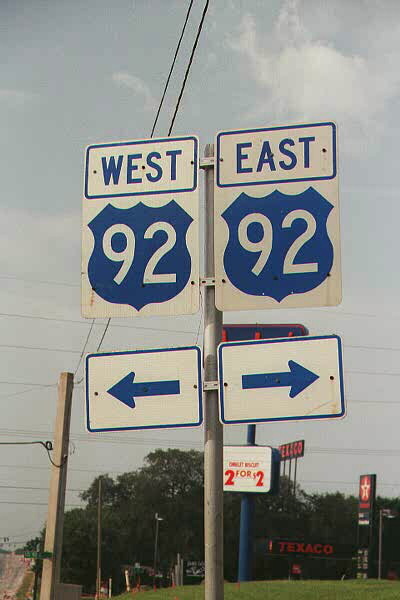 SR 27 was subsquently renumbered as SR 997 and SR 9336 to alleviate confusion. 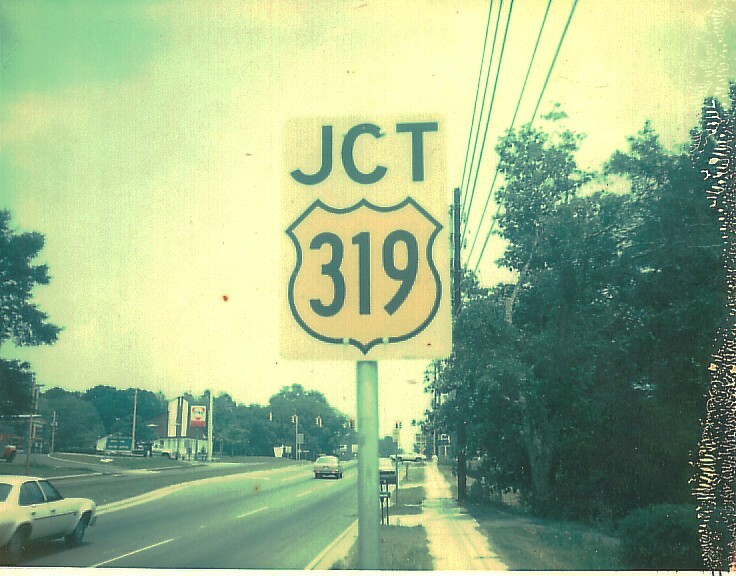 Photo taken by Michael Summa (1978). 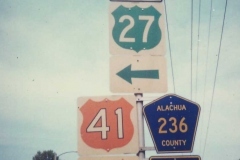 U.S. 27, U.S. 441, and Alachua County 236 converge in High Springs at the north end of Florida 45. 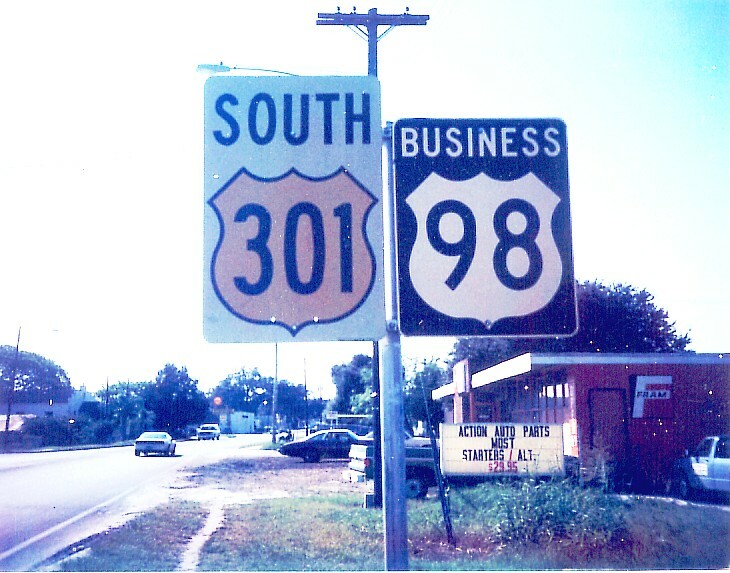 Photo taken by Michael Summa (1984). 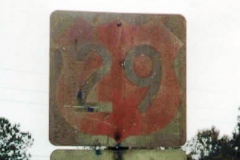 U.S. 27 Alternate shield assembly posted on Levy County 321 northbound. Photo taken 08/12/06. 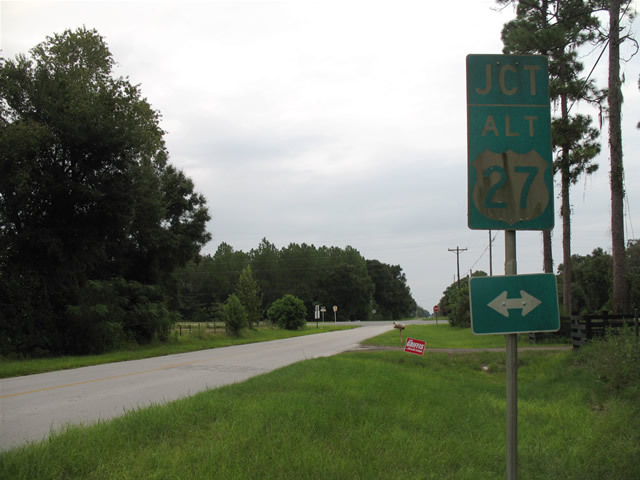 Looking south from the junction of U.S. 27-301-441 at Belleview. 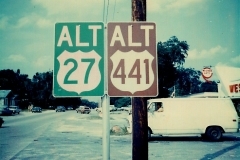 U.S. 441 Alternate was never signed alone and was always cosigned with U.S. 27 Alternate. 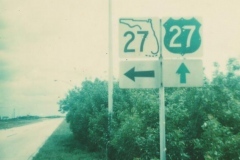 Now signed solely as Florida 25, the alignment in Bellview represented the old U.S. 27 & 441. 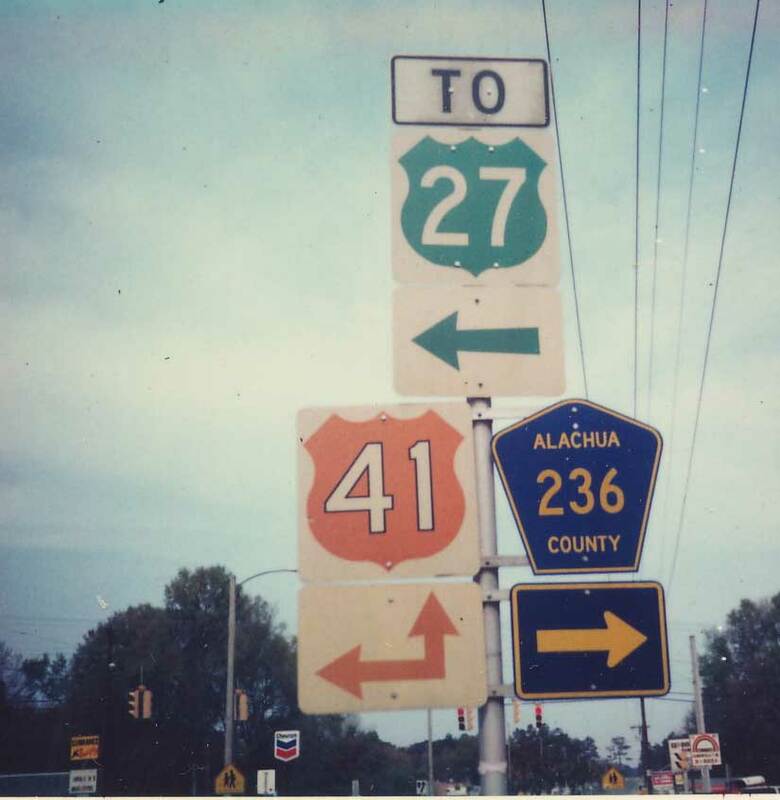 Photo taken by Michael Summa (1974). 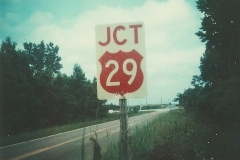 Escambia County 4 east at U.S. 29 in Century. Photo taken 12/07/99. 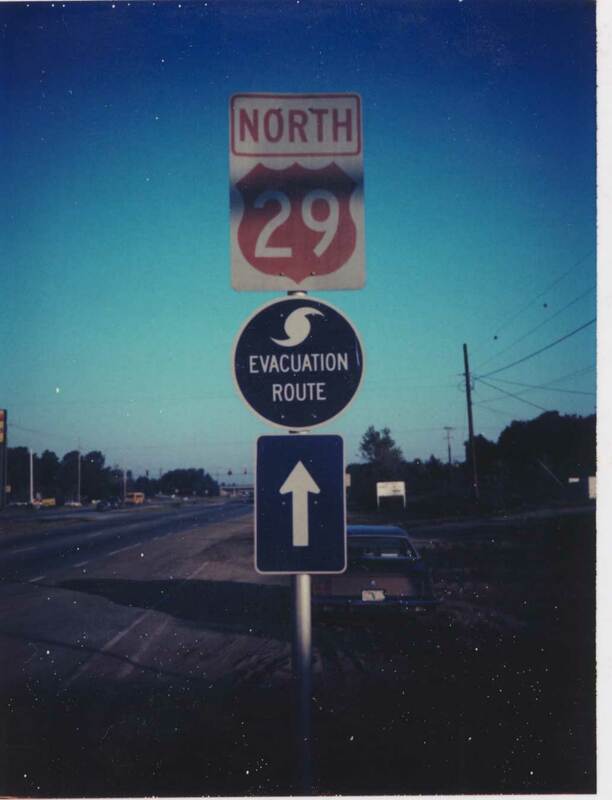 U.S. 29 north just prior its interchange with Interstate 10 northwest of Pensacola. 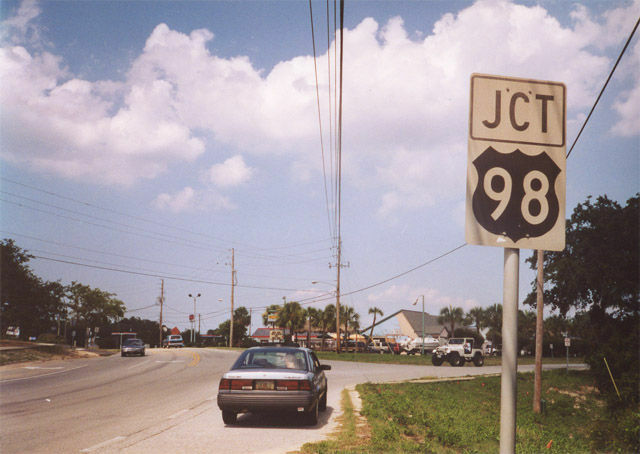 Photo taken by Michael Summa (1989). 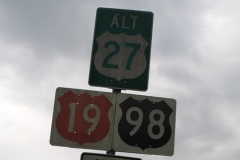 U.S. 29 assembly posted on what was Fla S-97 north near Molino. 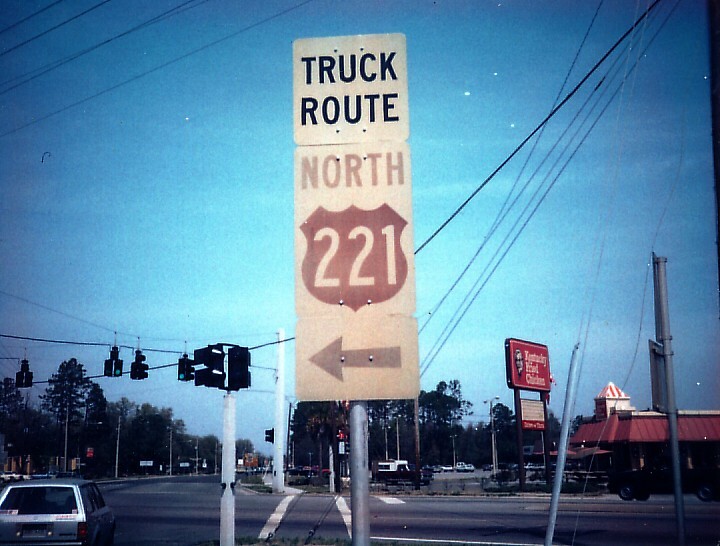 Photo taken by Michael Summa (1978). 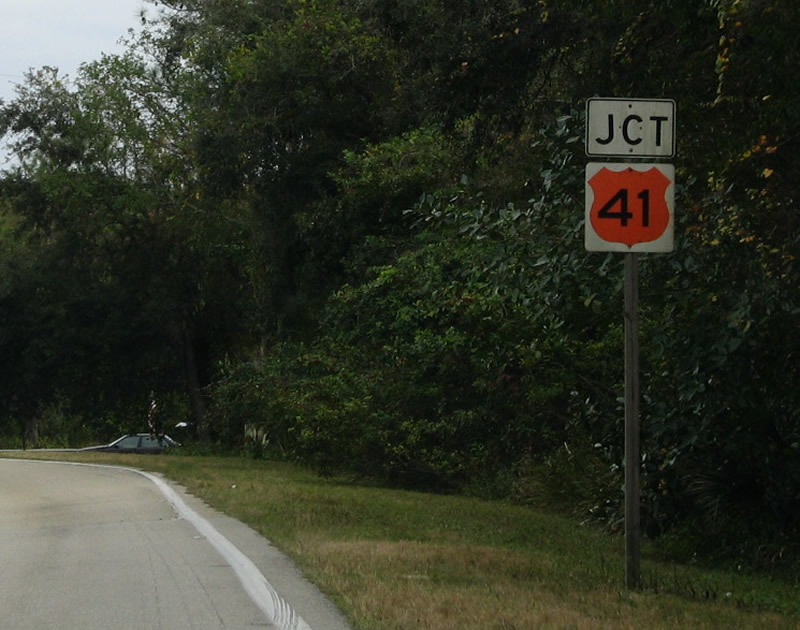 County installed marker for U.S. 41 posted along CR 92 (San Marco Road) east of Marco Island. Photo taken 12/31/03. 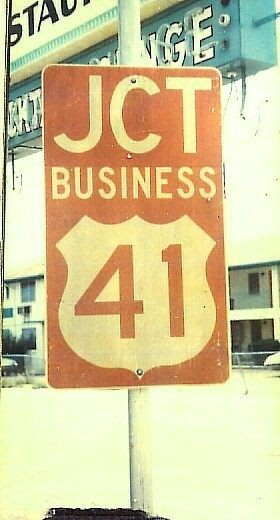 7th Street West links U.S. 41 Business with U.S. 41 in Palmetto. 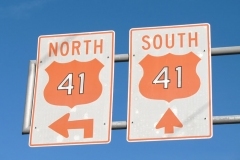 This set of overheads preceded the intersection with U.S. 41 & 301 along 7th Street eastbound. Photo taken by Justin Cozart (12/03). 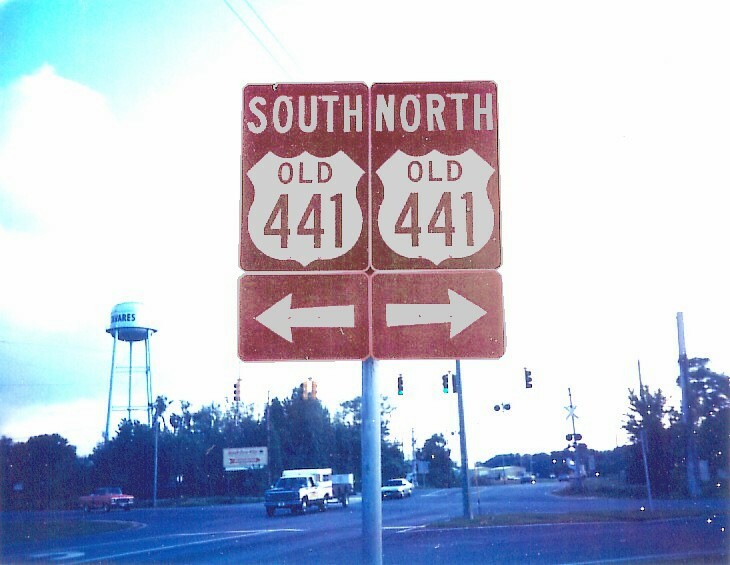 7th Street West links U.S. 41 Business with U.S. 41 in Palmetto. 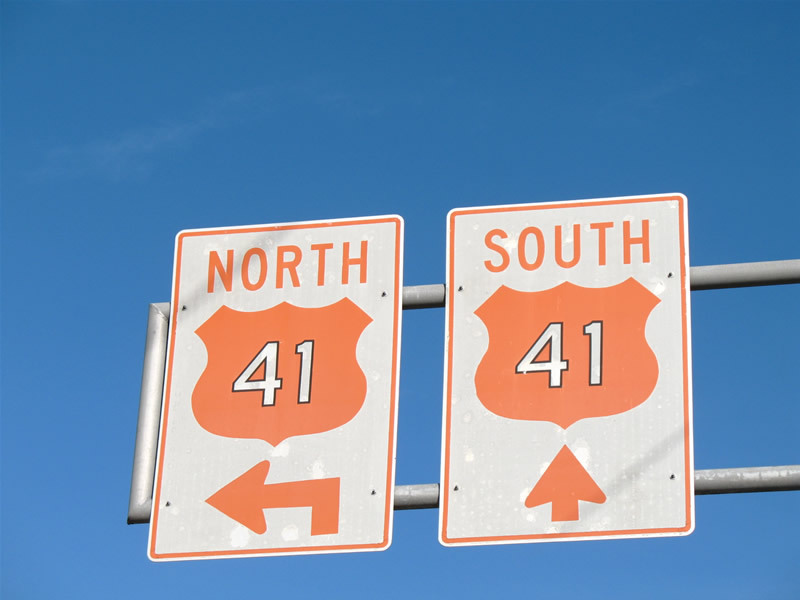 This set of overheads preceded the intersection with U.S. 41 & 301 along 7th Street eastbound. Photo taken 10/28/06. 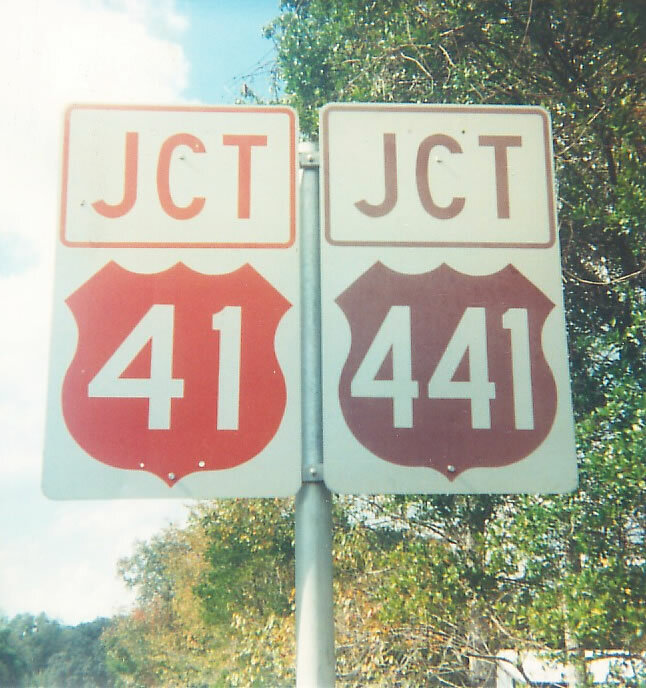 U.S. 41 & 441 shields at the west end of Florida 238 at Ellisville. 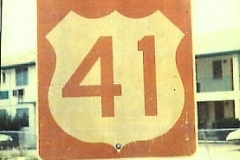 The previously familiar thin black outline around the white 41 numerals on the standard 24 inch marker were removed by this time. 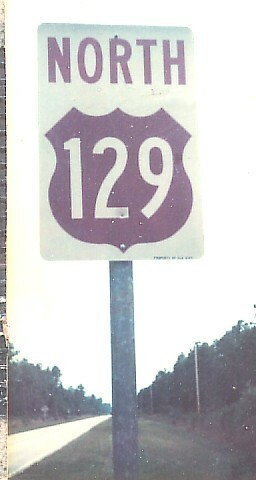 Photo taken by Michael Summa (1989). 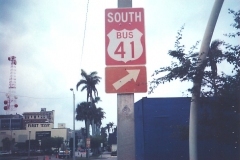 U.S. 41 is signed as an east west route in Miami-Dade County. 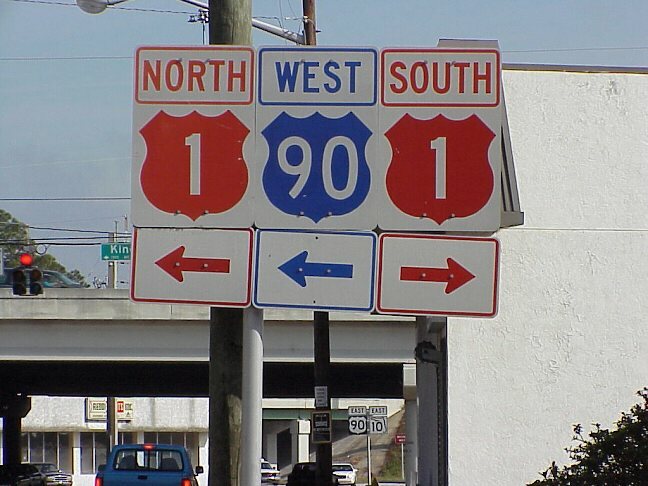 This assembly was located near the south end of Interstate 95 in Miami. 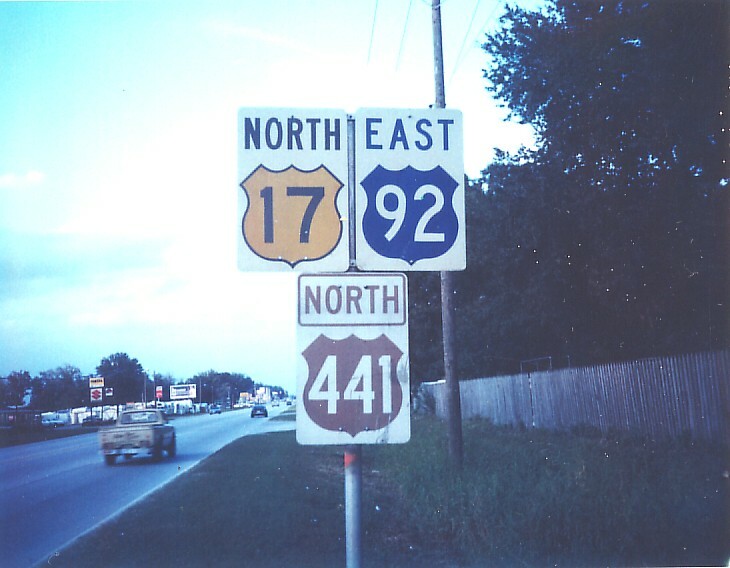 Photo taken by Michael Summa (1975). 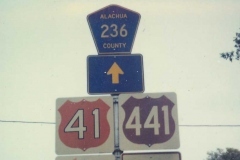 U.S. 41 Business shield posted along U.S. 92 in Tampa. 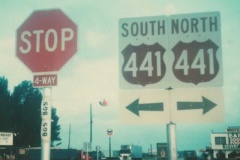 Photo taken by Michael Summa (1975). 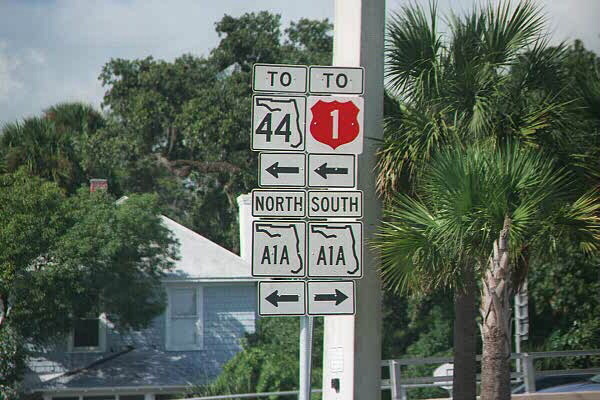 U.S. 41 Business assembly in Ft. Myers with the "post-1977" style of reverse color shields. Photo taken by Michael Summa (1982). 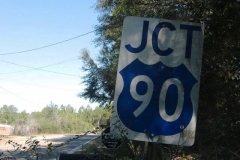 The last remaining blue U.S. 90 shield within Escambia County was posted on Millview Road north between Florida 173 (Blue Angel Parkway) and U.S. 90 (Mobile Highway). Photo taken 12/21/03. 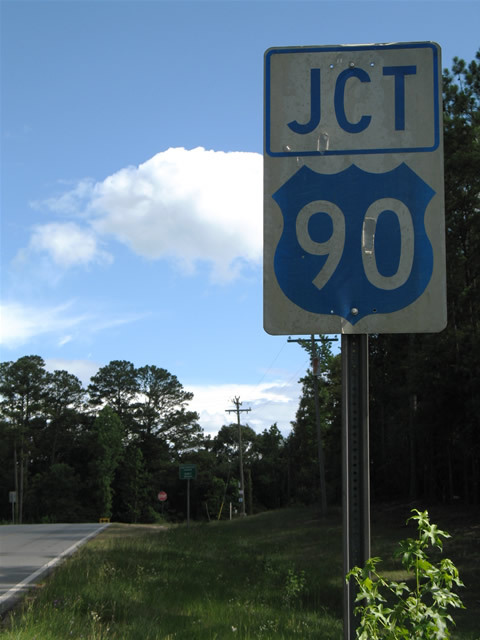 Blue U.S. 90 shield along 17th Avenue north at Cerventes Street in Pensacola. 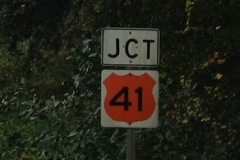 This sign was replaced by 2001. 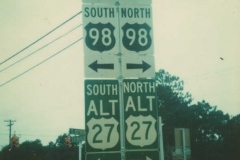 Photo taken 08/27/99. 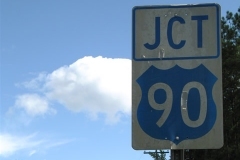 Gadsden County 269A south at U.S. 90 east of Chattahoochee. 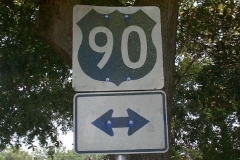 CR 269A links U.S. 90 with Georgia 97. Photo taken 06/12/06. 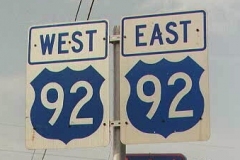 U.S. 92, along with U.S. 192, are the only two intra-state U.S. highways in Florida. 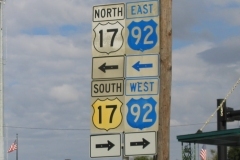 The route was signed with blue shields. 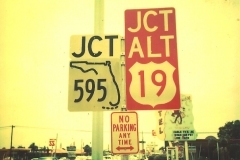 Photo taken by Jeff Royston (04/98). 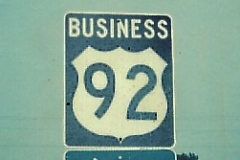 U.S. 92 Business in Lakeland. 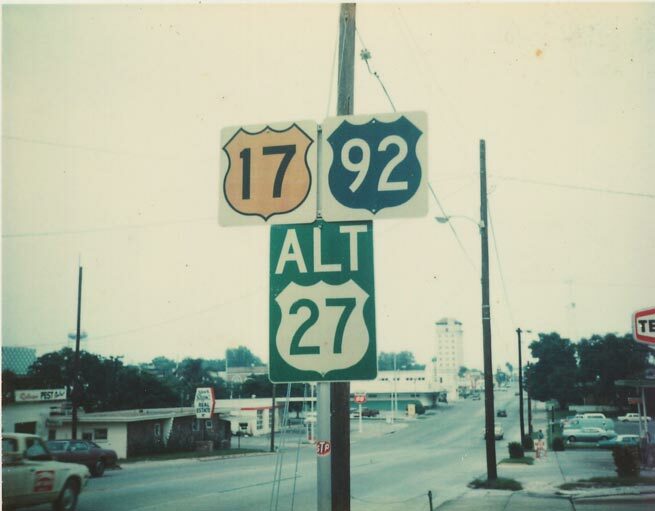 Photo taken by Michael Summa in 1978 when a detour was in place. This explains why the arrow was turned upside down. 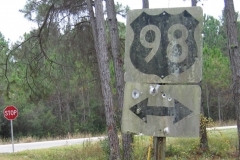 Faded U.S. 98 shield posted in Frankln County in the Florida Panhandle. 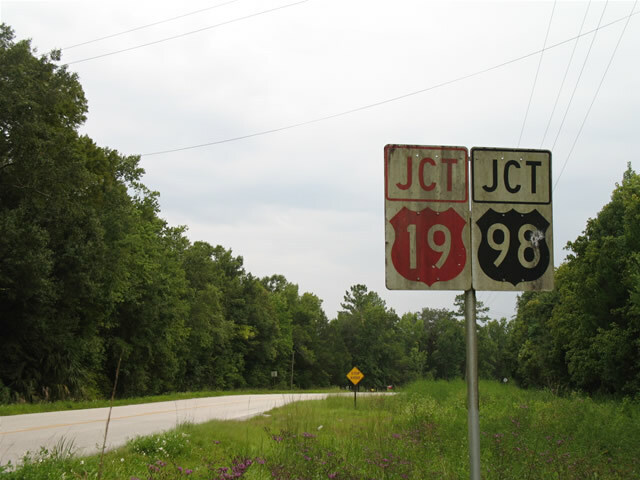 Photo taken by Justin Cozart (2004). 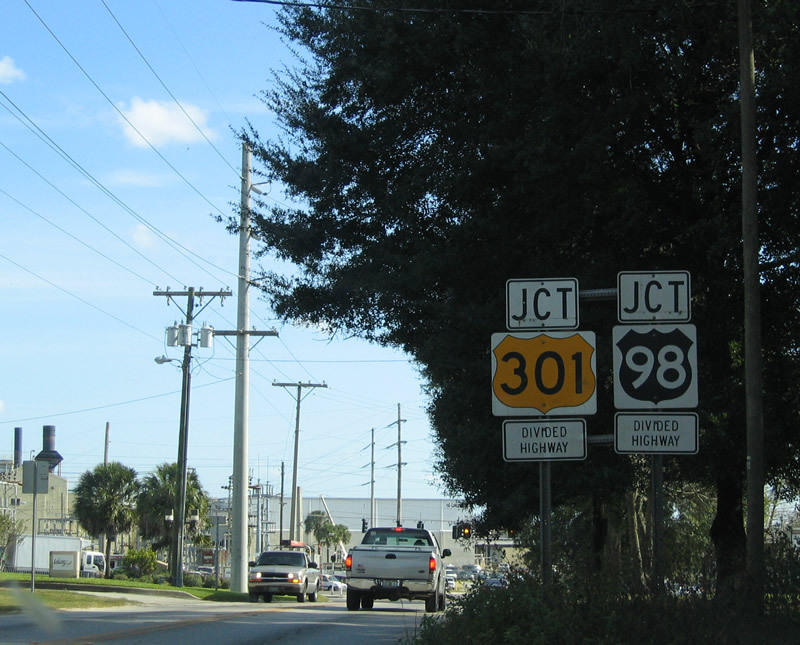 Shoreline Drive (former CR 30A) east ahead of U.S. 98 in Gulf Breeze. 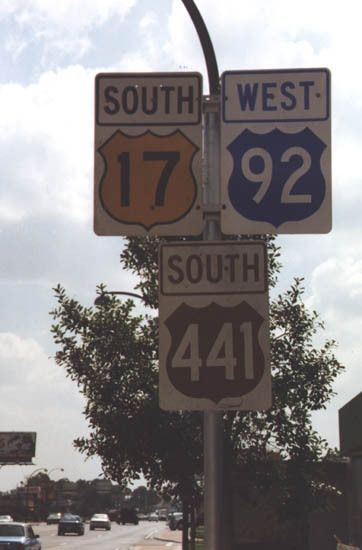 The sign remained in place through to at least summer 2004. Photo taken 06/23/01. 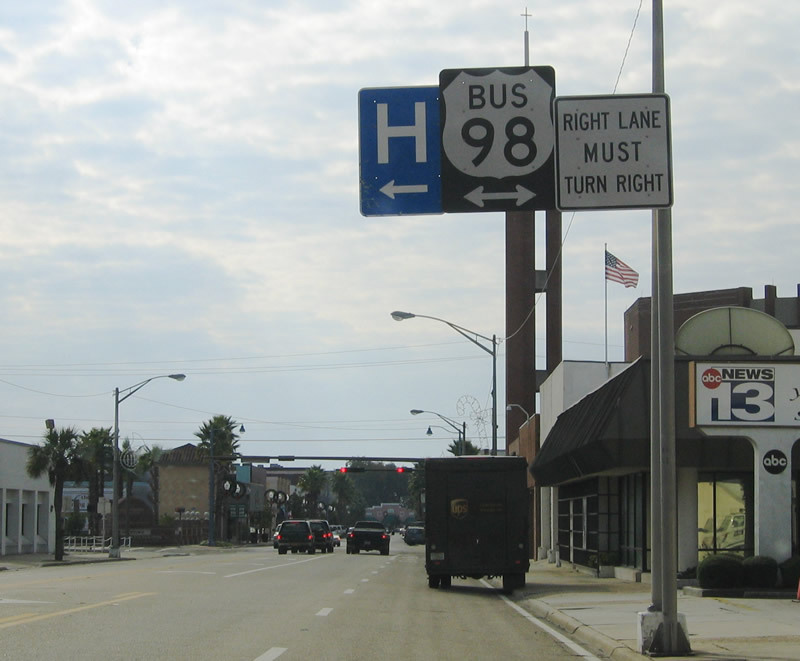 Approaching U.S. 98 on U.S. 231 northbound in Panama City. Photo taken 07/31/06. 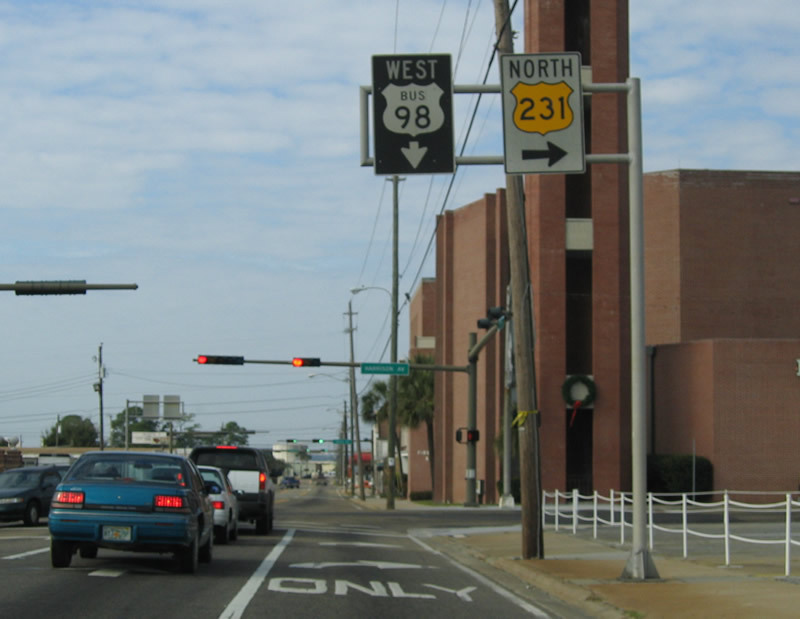 Overheads for U.S. 98 east at U.S. 231 in Panama City. Photo taken 06/12/06. 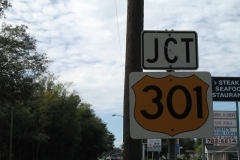 Pasco County installed shields along Lock Street in Dade City. 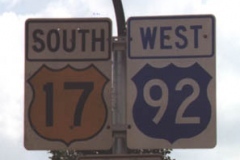 As of October 2006, these shields were replaced with standard black and white assemblies. Photo taken by Justin Cozart (12/03). 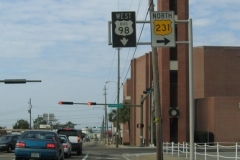 U.S. 231 south approaching U.S. 98 Business in Downtown Panama City. 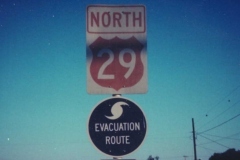 Business and Alternate routes were shown in the reverse pattern as the regular shield. Photo taken by Justin Cozart (12/03). Westbound U.S. 98 Business at the south end of U.S. 231 in Panama City. 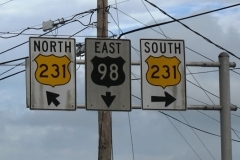 These overheads were replaced by 2006 with standard green/white signs. 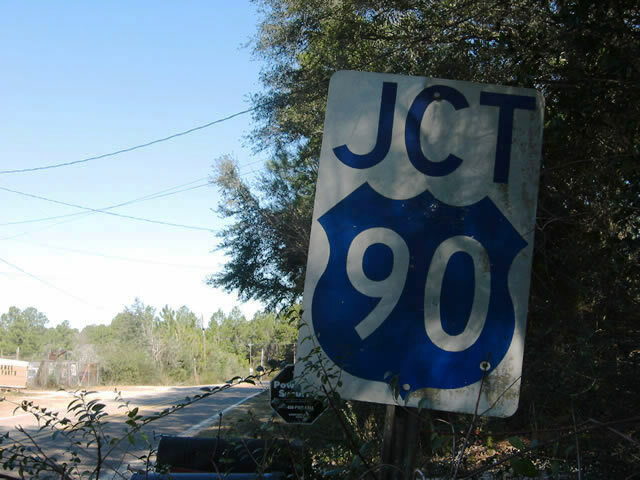 Photo taken by Justin Cozart (12/03). 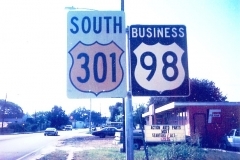 U.S. 301 and an older style U.S. 98 Business shield assembly posted in Dade City. 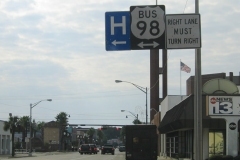 The Dade City business loop was decommissioned in October 2006. Photo taken by Michael Summa (1984). 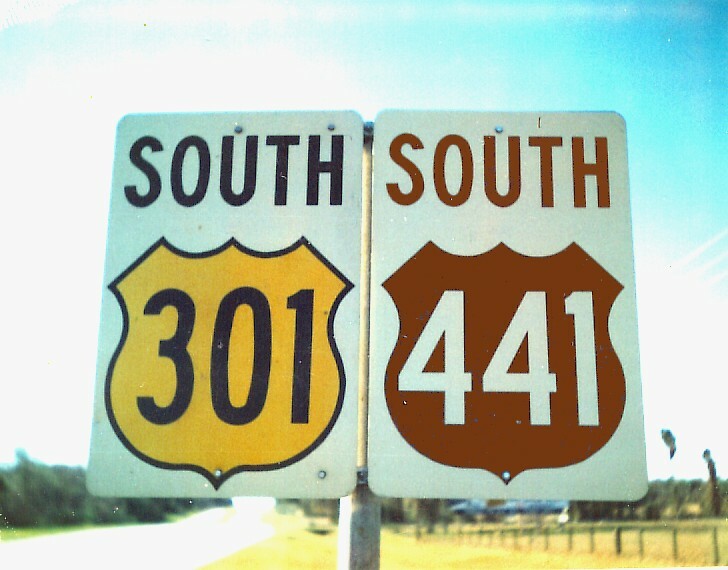 Levy County 320 east at U.S. 129 near Chiefland. Photo taken 08/12/06. 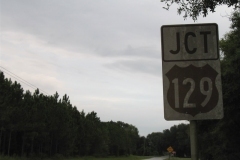 Northbound U.S. 129 reassurance marker, likely posted beyond Interstate 10. 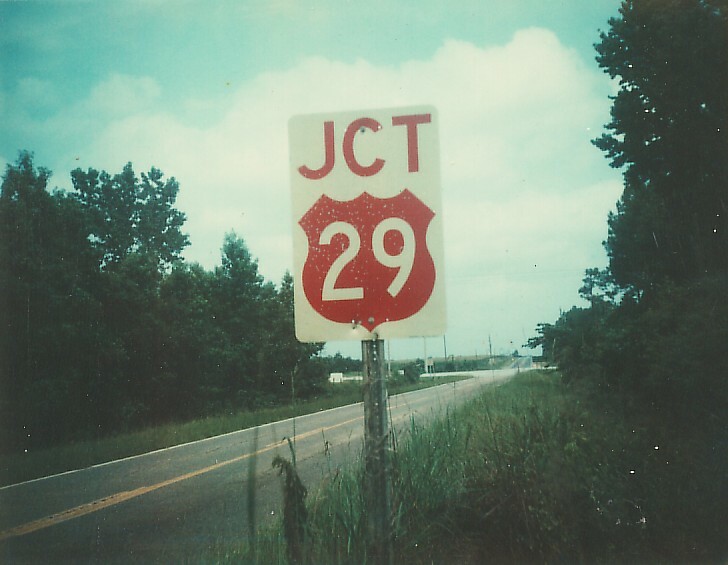 Photo taken by Michael Summa (1983). 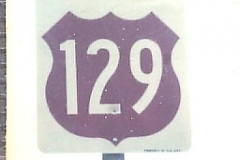 U.S. 192 used green markers, and until its extension west to U.S. 27, did not intersect another route with the same color designation. 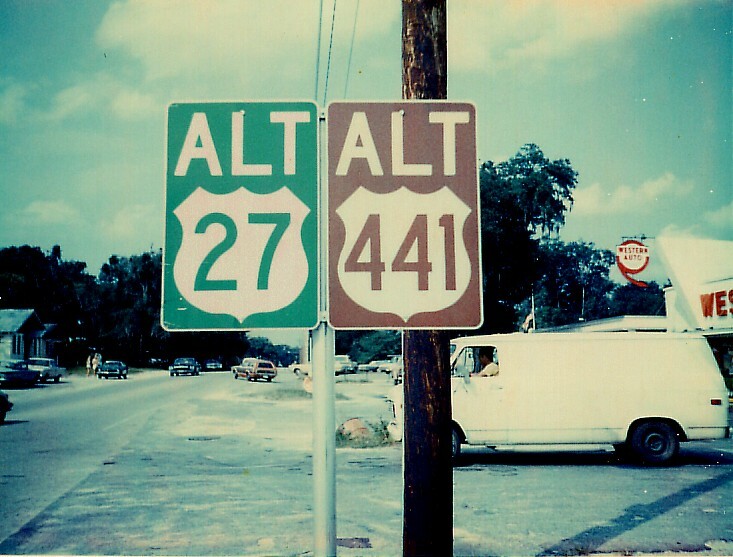 Photo taken by Michael Summa (1974). 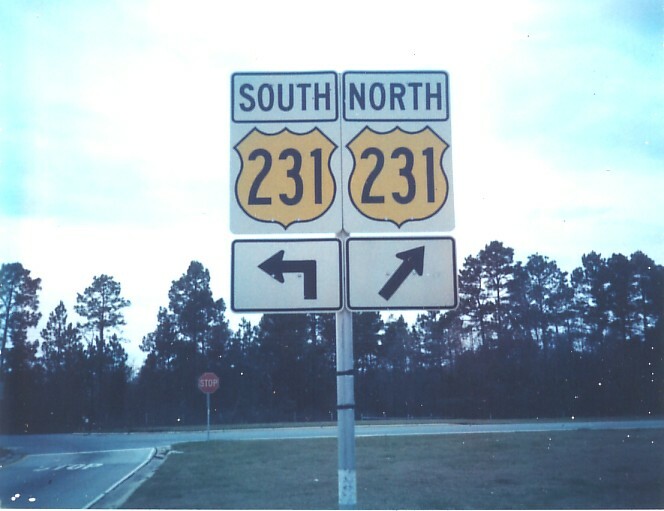 Borderless style shield for U.S. 221 posted at the northbound beginning of the route in Perry. 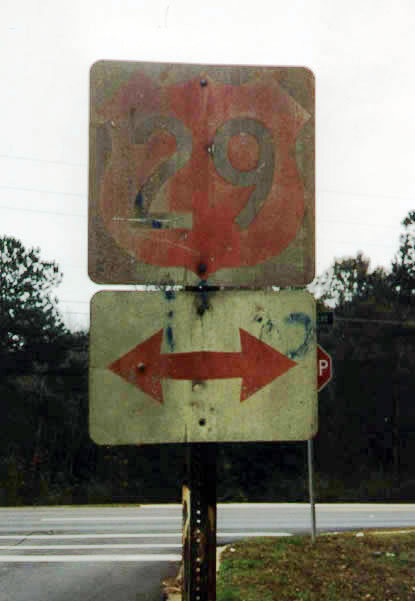 Photo taken by Michael Summa (1989). 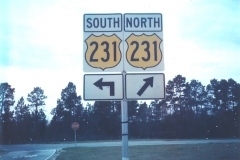 U.S. 231 shields posted along the westbound off-ramp from Interstate 10. 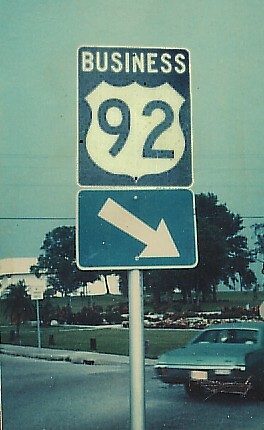 Photo taken by Michael Summa (1989). 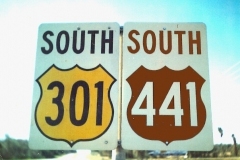 U.S. 301 and 441 reassurance shields posted north of Ocala. 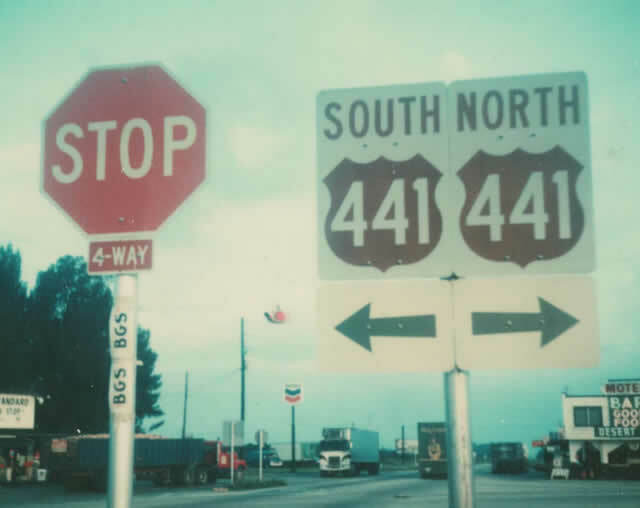 Photo taken by Michael Summa (1974). 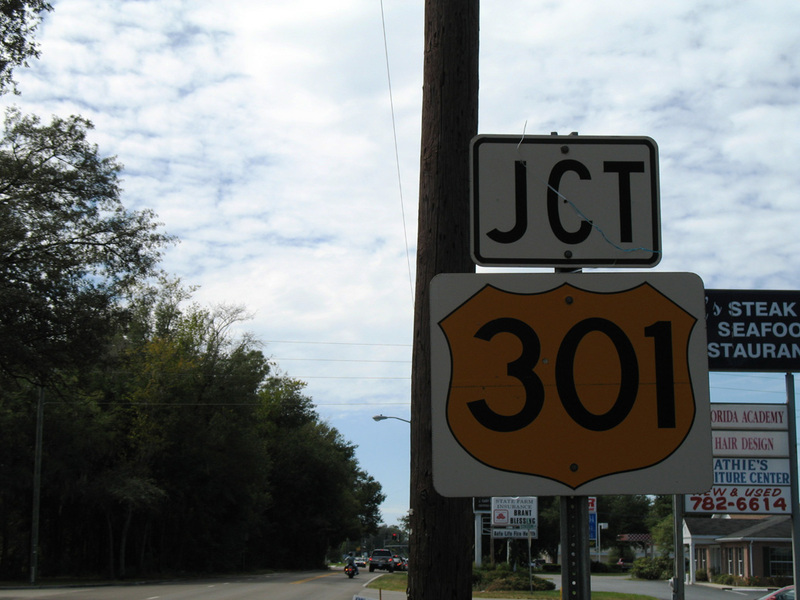 County-installed U.S. 301 assembly posted along Pasco County 54 west in Zephyrhills. Photo taken 10/15/06. 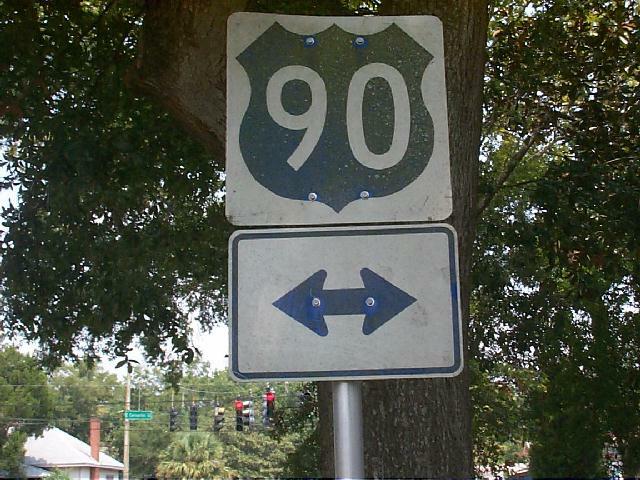 U.S. 90 east at U.S. 319 in Tallahassee. 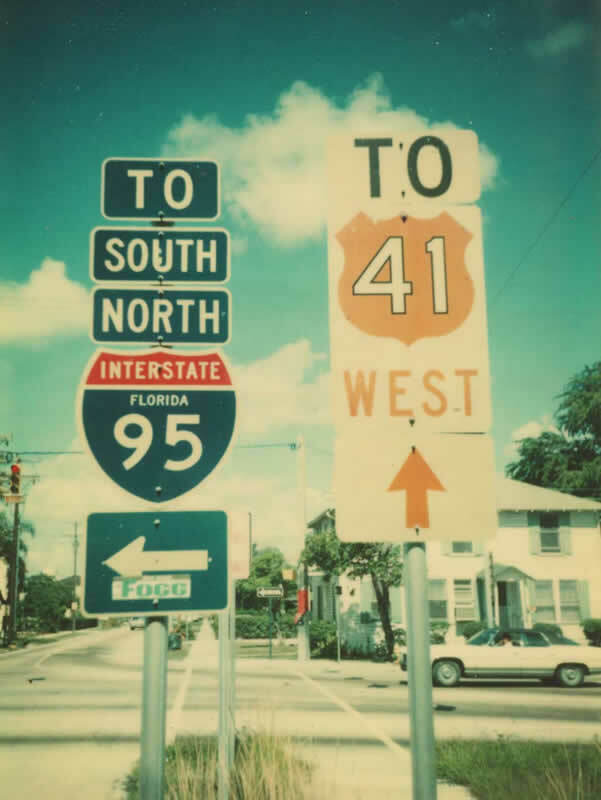 Photo taken by Michael Summa (1978). 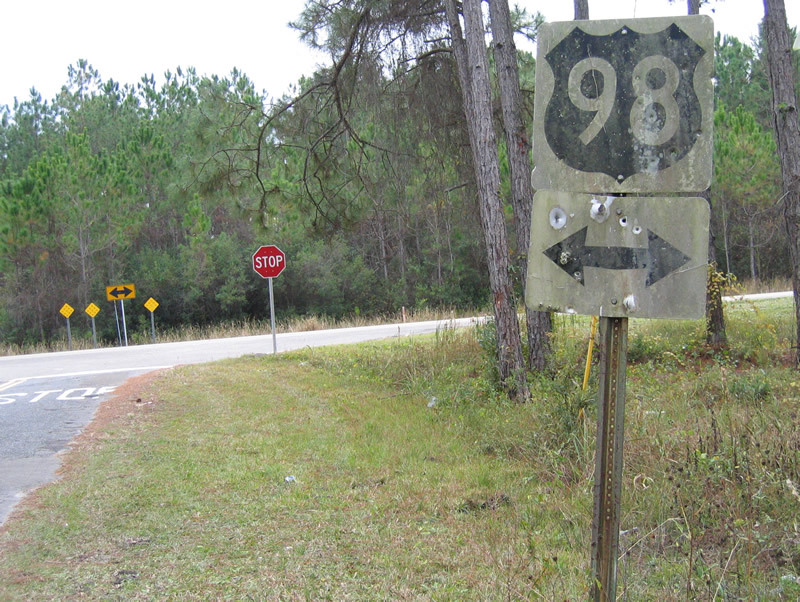 U.S. 98 west at the south end of U.S. 331 in Walton County. 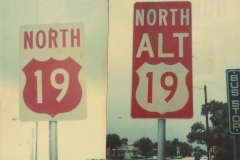 Photo taken by Michael Summa (1978). 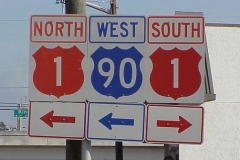 Westbound Florida 60 at U.S. 441 and Yeehaw Junction. 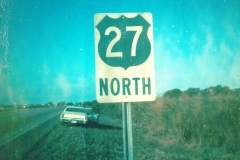 Photo taken by Michael Summa (1975). 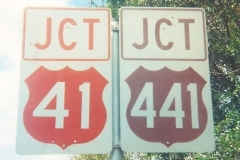 Old U.S. 441 shields posted within the Mount Dora vicinity. Photo taken by Michael Summa (1984).